Oboe reeds are expensive ($15-$30). They will last longer if stored in a proper reed case. An oboe reed case that holds the reeds tightly via french ribbon holders or a foam rubber grip holder is ideal (left and middle pic above). Avoid cases with what is known as pop-up mandrels (pic on the right) unless it has extra cushion to hold the reeds tightly on the mandrels when closed. If there is no extra cushion in these cases, the reeds will tend to slide off the mandrels and roll around freely in the case, causing the reeds to chip and/or crack. 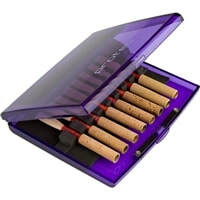 I recommend that beginners have an inexpensive reed case that holds a minimum of 3-4 reeds. 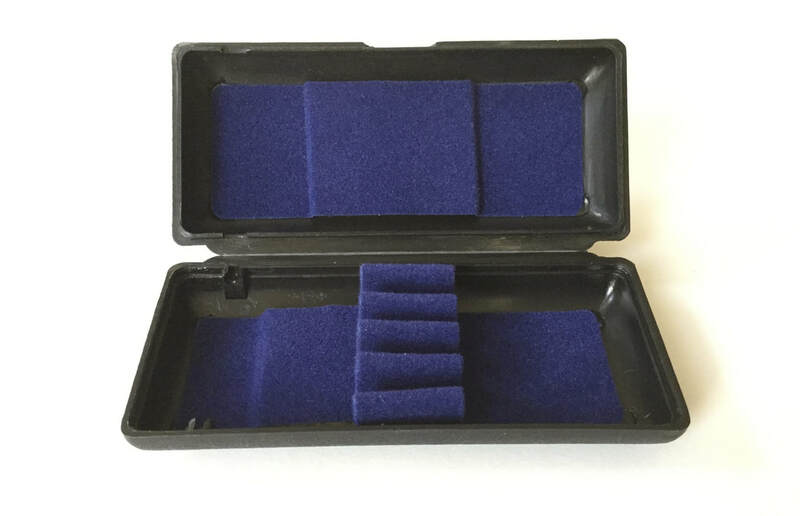 (FYI: You can find reed cases that hold 3 to 50 reeds.) As an oboist advances, so will their tendency to collect reeds, which means they may eventually need a case that holds 5-10 reeds. Oboe reed cases can be found at many online retailers and places that sell oboe reeds. How long do oboe reeds last? How many does my oboist really need? There is no way that I can tell you with utmost certainty how long a reed will last. They are delicate and the cane is scraped very thin in order for it to vibrate. This fragility makes them easy to damage (chipping of the tip, cracking, etc.). The best way to prolong the life of any reed is to make sure it is stored in a reed case in which the reed is held tightly and securely (see "The Reed Case is Important" above). Oboe reeds are also very susceptible to climate changes (humidity/dryness), altitude, and temperature. If you live in an area with different seasons, your oboist will feel the change of season in the way their reeds respond and play. A reed made or purchased during the humid summer months will likely not play the same way during the dry winter months. A reed made in Michigan will not play well in Denver, Colorado. Denver's higher altitude will change the way the Michigan reed plays. If buying hand-scraped reeds, make sure your reed maker lives in the same geographic area in which the reeds will be played. The number of times a reed is soaked and how long it is allowed to sit in the water will also influence a reed's longevity. Only the cane needs to be submerged in water. (Water touching the thread is normal.) An oboe reed should never sit in water for more than 2-3 minutes at a time, depending on the temperature of the water. Reeds soak up faster in warm water than in cold water. In a pinch, the reed may be soaked in the mouth, but this is generally not preferred as saliva breaks down the cane more quickly than water, thereby shortening the life of the reed. It is handy for an oboist to have a small container specifically for soaking their reeds . Back in the day, a 35 mm film canister was the best thing to use. Now, oboists will re-purpose pill bottles (wash and remove prescription info first) or any small container that will support the reed at the thread while it soaks. 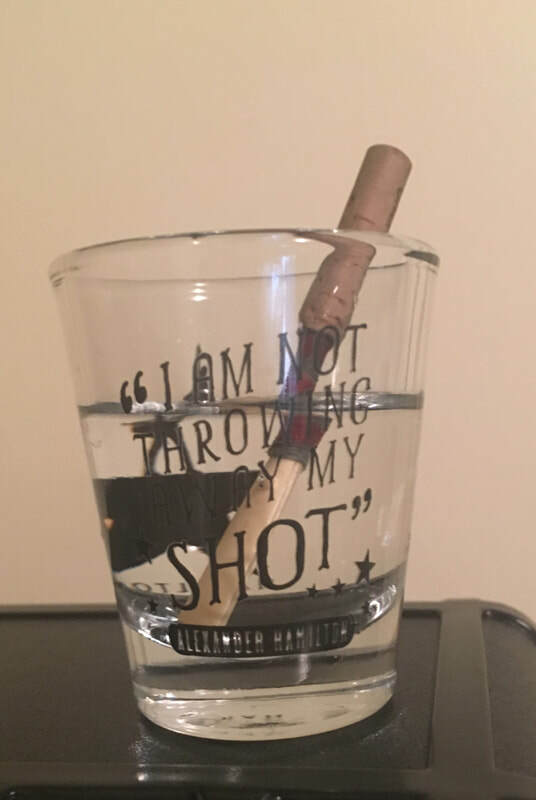 If the opening of the container is too wide, the reed can slip down and become totally submerged, which is not good for the cork. You can find various oboe reed soaking containers online, some of which have water-tight lids and clip on to the music stand, or simply get creative and recycle something from around the house. 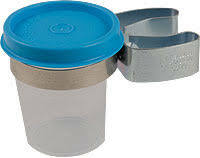 I personally prefer a container without a lid. I like to always use fresh water when soaking my reeds. If there's a lid, the oboist might get a little lazy about changing the water, which can be unsanitary. So, considering all that, my recommendation for young oboists is this: start with at least 3-4 reeds. Write a number on the top part of the cork (near the thread) with a fine point Sharpie on each one. Cover the number with clear nail polish to keep it from disappearing. The oboist should then rotate through the reeds, changing reeds each week (or every few days). 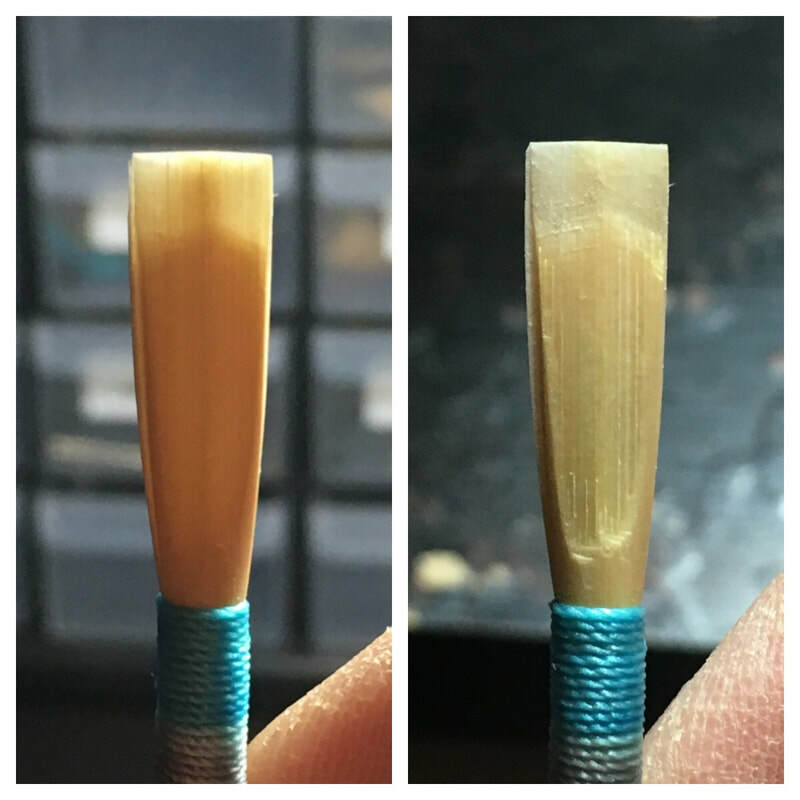 If things go well, it is entirely possible that the three reeds could last 4-6 weeks, depending on how much they are played and if they are cared for properly. However, if the oboist is seriously engaged (practicing 5-6 days a week for 30-60 minutes), they may tend to go through reeds more quickly. As the oboist's embouchure gets stronger and they start playing for longer periods of time, they may need to increase their reed strength. For example, a typical Medium Soft strength is usually good for beginners, but as soon as they figure out how to truly support their sound, they may blow so much air that the Medium Soft reed just can't handle it. The reed will literally stop vibrating because they are blowing so much air, the tip of the reed will collapse. If you start hearing a lot of complaints about the sound suddenly stopping when they are playing, it might be time to increase the reed strength. DISCLAIMER: I am not paid to endorse any particular brand, reed maker, or seller. These suggestions are based only on my personal experience. There are many variables at play when it comes to oboe reeds. Due to the nature of their construction, they can vary reed to reed even within the brand or reed maker. For example, a reed purchased in January may not be identical to a reed purchased in March. I look for overall consistency in construction and quality of materials when selecting reeds from a company or reed maker. Playing comfort is also dependent upon how the embouchure holds the reed and the amount of air support being used. What works for my playing setup and that of my students may not work for you, so please keep that in mind if you try one of these specific reeds. A Word About Oboe Reed "Strength"
Purchasing oboe reeds can be very confusing. Frequently, manufacturers/reed makers use terms like soft, medium-soft, medium, medium-hard, hard. These terms usually refer to how much air the player will need to blow through the reed in order to produce a sound. Unfortunately, there is not a universal scale for this. What one reed maker describes as medium soft may be what another describes as soft. It often takes much trial and error to find the right "strength" within a particular reed maker's reeds. In general, I recommend a medium-soft or medium strength for beginners. 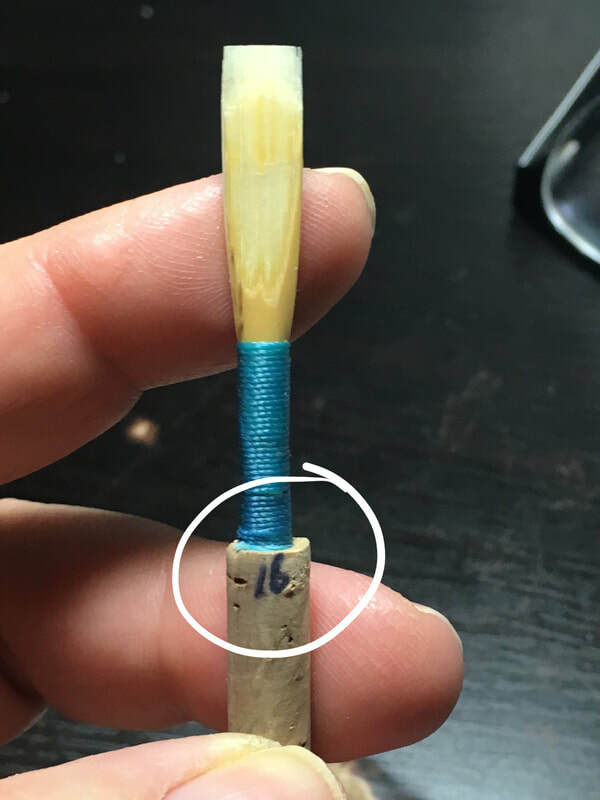 If the reed blows too easily, it does not require the player to build up any embouchure muscles. The reed needs to have a little bit of strength so that it can support the air and embouchure as a beginner learns how to play. Once the oboist has been playing for 6-12 months, I recommend increasing their reed strength one level. This will continue to strengthen their embouchure as they begin to gain more skill with articulation and playing dynamics. 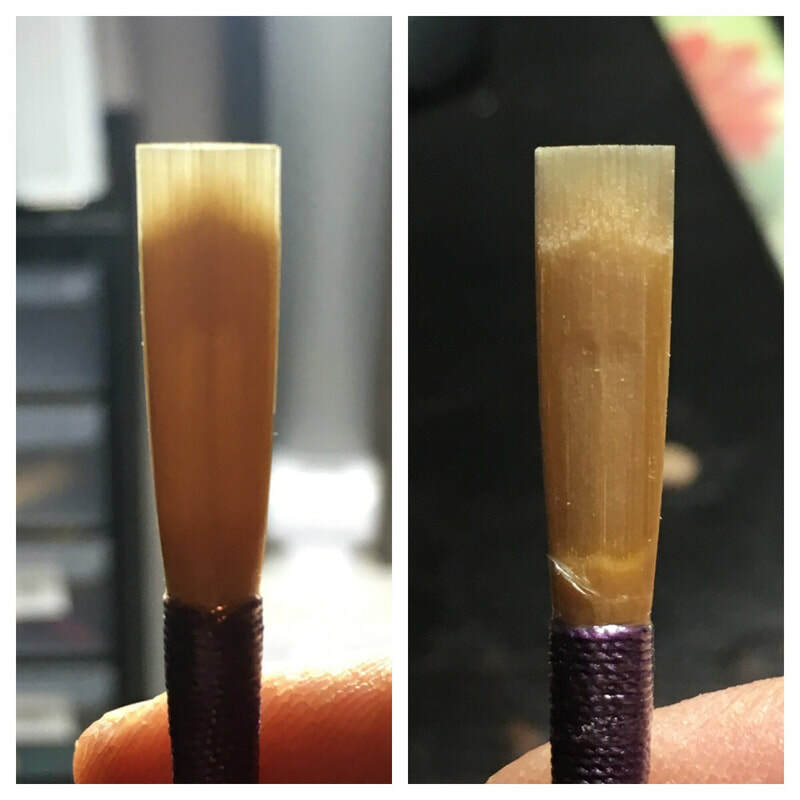 Those that hand-scrape their reeds will often provide much more detail regarding how the reed plays, which should make deciding which one to order a little easier. Order a lighter reed for beginners and one that has a bit of resistance for intermediate players. The HB Student Oboe Reed ($16) is an excellent choice for beginning/intermediate oboists who use a "round" or "straight-line" embouchure. If your oboist's embouchure tends to look like a "smile," this may not be a good reed choice for you. This reed has an American style scrape. Intermediate to Advanced players may find success using the American style Jones Artist Oboe Reed (Medium or Medium Hard). I would not recommend the Medium Soft strength as it might be too easy. The Jones Artist Oboe Reed is a recent discovery that I am going to monitor over the next several months. I'd like to get a sense of their consistency, but at first glance, I really like what I see and hear from these reeds. This reed has an American style scrape. Another option is to search for hand-scraped American style oboe reeds on etsy.com. You will find a wide variety of hand-scraped oboe reeds at various price points, strengths, and styles. It may take some trial and error to find a reed maker that you like, but you will be buying from an oboist and will be able to interact with them throughout the purchase process. Many will likely be able to customize the reeds for your oboist, too. Midwest Musical Imports and Hodge Products are stores that cater to oboists. They both stock a wide variety of reeds and have very helpful staff that could help guide you to a good reed for your oboist.